If any one of the following items do not conform to the specifications the yacht is not considered as a class 3. The length of the mast is limited to 6.10 metres. A fluorescent orange strip, 40 mm wide and minimum 2 m long, is stuck on the leading edge of the mast. MAXIMUM TRACK: The yacht, fully rigged with a pilot in the cockpit, must pass between two vertical posts with a 3.5 m gap between them. WHEEL BASE: the distance between the axle of the front-wheel and the axle of the rear wheels must not exceed 3.8 m.
STEERING SHACKLES must be of stainless steel, minimum 5 mm diameter, and locked with wire. STEERING CABLES must be of stainless steel, minimum 4 mm diameter, and must be fastened with ferrules and thimbles, or swaged on terminals. CABLE TENSIONERS (e.g. bottle screws) must be of stainless steel, minimum 6 mm diameter, with a safety system to prevent looseness (wire or locking nuts). An efficient brake will be fitted. The maximum total propulsive area, (sail + mast + boom), is 7.35 sq. m.
The total weight, fully rigged, but without the pilot and without any ballast, will be a minimum of 100 kg. A roll bar must be fitted to the yacht. It may however be replaced by an equivalent construction of the yacht body. 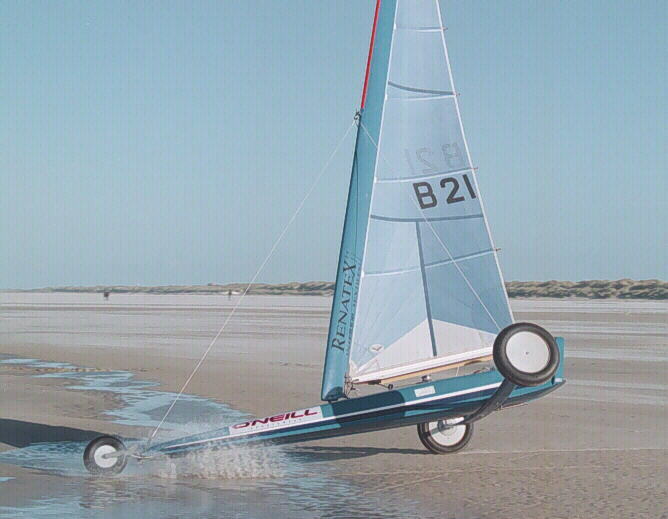 In each case, roll bar or body, it must extend a minimum of 10 centimetres above the crash helmet of the pilot in the sailing position.